The Associated Student Body Clubs and Events Board set plans for the upcoming Club Day in motion and appointed a director of media relations to the board during their meeting Tuesday. The board unanimously approved the theme “Under Wonderland” for the Club Day set for Nov. 19. The club contest this time around will possibly feature more than one club taking home the prize. The clubs will be tasked to find 16 representatives to form a team to compete in a life-size chess game against the ASB boards. If the clubs win, all clubs participating will receive $30 each. Another activity discussed was a possible croquet game. Valencia Scott, who was appointed to the Student Senate on Oct. 22, was appointed to the CAEB board as director of media relations. Scott noted her previous experiences at college as her qualifications for serving on the board. With the appointment of Scott, the CAEB board, which started the year with only three members, is now full. Three resolutions involving campus accessibility and LGBT representation entered their second reading during the meeting. 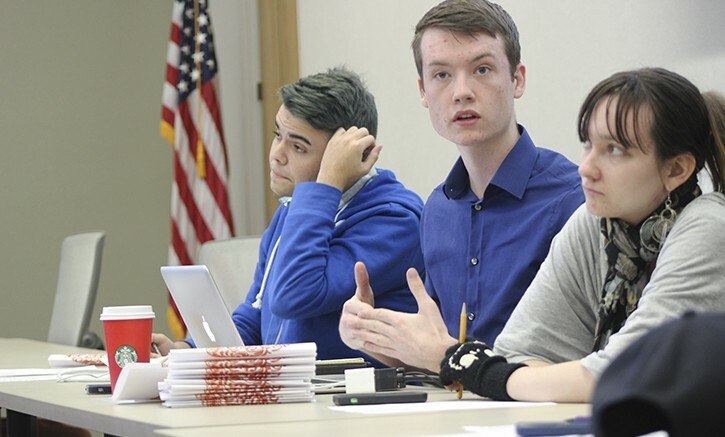 The first resolution, which called for the formation of a pride center on campus, seemed to spark the most discussion. The resolution said that the lack of representation and safe spaces for the LGBT community is an institutional problem. Director of Finance James Cortright mentioned that a potential pride center might not be something that the majority of members of the LGBT community need. The two other resolutions called for surveys to be conducted on campus to poll students on how accessible they feel the campus is for the disabled population and if there needs to more availability for interpreters for deaf students. After discussing all three resolutions, CAEB President Justin Nicholson urged the board to remember what CAEB can and cannot do. Be the first to comment on "CAEB plans for the next Club Day"